Summer is officially here and we can't think of a better way to enjoy the warm weather than being outside with family and friends and watching a funny, action packed movie. But why stop there? Invite the whole neighborhood over to join in on the fun! KUNG FU PANDA 3 AWESOME EDITION arrives on Blu-ray™ and DVD June 28th. 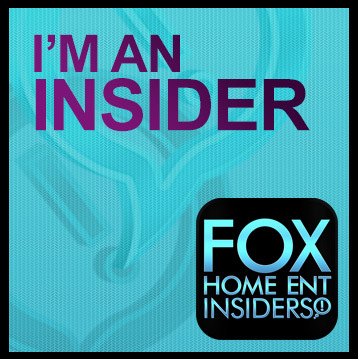 Purchase the DVD on Amazon for $15.96 & FREE Shipping on orders over $49 or the Blu-ray for $19.95 & FREE Shipping on orders over $49. Prepare for a pand-tastic summer adventure as Po - reunited with his long-lost father - journeys to a secret village and meets countless panda friends and family! But when the supernatural villain Kai challenges all the Kung Fu masters across China, Po must discover the teacher within himself and train his clumsy brethren to become the ultimate band of Kung Fu Pandas! DreamWorks Animation’s KUNG FU PANDA 3 is not only one of the best reviewed films of the year, but also one of the top five grossing films of 2016 worldwide. Everyone’s favorite wise-cracking, dumpling-snacking hero is back in “the best Kung Fu Panda yet,” proclaims Pete Hammond of Deadline.com. A hit with audiences and critics alike, the film received an outstanding audience reaction with a coveted “A” CinemaScore® and Certified Fresh on RottenTomatoes.com. 20th Century Fox Home Entertainment releases DreamWorks Animation’s KUNG FU PANDA 3 AWESOME EDITION on Digital HD on May 13 and Blu-ray™ and DVD on June 28. From Academy Award® nominated director, Jennifer Yuh Nelson (Kung Fu Panda 2) and Alessandro Carloni (How to Train Your Dragon), KUNG FU PANDA 3 features the voice talents of Golden Globe® nominee Jack Black (Shallow Hal, School of Rock), Emmy®, Golden Globe®, Screen Actors Guild® and Tony® award winner, Bryan Cranston (“Breaking Bad,” Trumbo, Argo), two-time Academy Award® winner Dustin Hoffman (Meet the Fockers, Rain Man, The Graduate), Academy® and Golden Globe® award winner, Angelina Jolie (Girl, Interrupted, Lara Croft: Tomb Raider), Academy® and Golden Globe® award winner, J.K. Simmons (Whiplash, Juno), Jackie Chan, (Rumble in the Bronx, Rush Hour), Seth Rogen, (The Interview, Neighbors), Lucy Liu (Charlie’s Angels, Kill Bill), David Cross (“Arrested Development”), Golden Globe Award® winner and Academy Award® nominee, Kate Hudson (Almost Famous, How to Lose a Guy in 10 Days) and James Hong (Blade Runner). Kick off the summer with the KUNG FU PANDA 3 Awesome Edition on Blu-ray™, DVD and Digital HD. 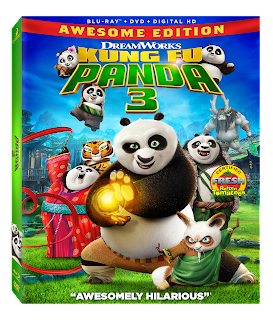 Featuring more fun, funny and action packed bonus features including 2 all-new Kung Fu Panda animated shorts, Everybody Loves A Panda Party Karaoke with Po, Make a Panda Party Paper Pal and more! 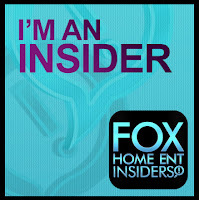 Disclosure: I am a Fox Home Entertainment Insider. I will receive a copy of this title. No other compensation was received and any opinions expressed are my own.